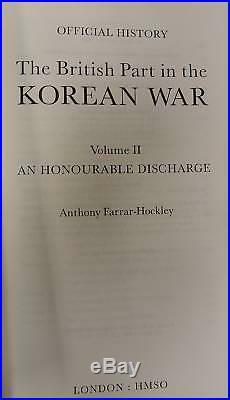 THE BRITISH PART IN THE KOREAN WAR - THE OFFICIAL HISTORY / Volume 1 - A Distant Obligation & Volume 2 An Honourable Discharge. Both volumes hardbound in dust jackets. Dust jackets show very minor shelf wear (very good condition). Volume 1 covers from the oubtreak of the war through operations ending in January 1951. 1990 6 1/4 by 10, 512 pages, 17 maps, 59 illustrations with many appendices including numerous orders of battle. Volume 2 picks up in February 1951 and continues thru to the end of the war in 1953. Includes the famous Imjin River fight and the Kapyong river operation. 6 1/4 by 10, 534 pages, numerous illustrations, maps, etc. 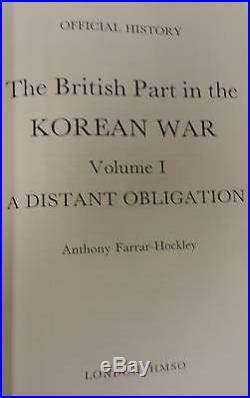 The item "BRITISH OFFICIAL HISTORY FOR KOREAN WAR-2 VOLUMES" is in sale since Friday, August 27, 2010. This item is in the category "Collectibles\Militaria\Korea (1950-53)\Original Period Items". The seller is "tnmilbks" and is located in Nashville, Tennessee. This item can be shipped to United States, Canada, United Kingdom, Denmark, Romania, Slovakia, Bulgaria, Czech republic, Finland, Hungary, Latvia, Lithuania, Malta, Estonia, Australia, Greece, Portugal, Cyprus, Slovenia, Japan, Sweden, South Korea, Indonesia, Taiwan, South africa, Thailand, Belgium, France, Hong Kong, Ireland, Netherlands, Poland, Spain, Italy, Germany, Austria, Israel, Mexico, New Zealand, Philippines, Singapore, Switzerland, Norway, Saudi arabia, Ukraine, United arab emirates, Qatar, Kuwait, Bahrain, Croatia, Malaysia, Brazil, Chile, Colombia, Costa rica, Dominican republic, Panama, Trinidad and tobago, Guatemala, El salvador, Honduras, Jamaica.